Firefighters, security officials, and farmers work to prevent balloon-ignited fire from spreading to greenhouses. 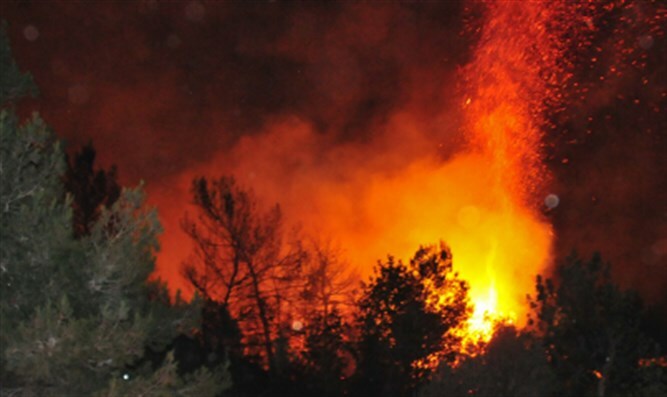 A large fire erupted on Saturday night in the southern town of Ein Habesor after an incendiary balloon from Gaza landed in the area. Several teams of firefighters, as well as security officials and local farmers, are working to prevent the fire from spreading to local greenhouses. On Monday, incendiary balloons ignited five fires in the Gaza border area, which serves as one of Israel's main agricultural areas. At the beginning of September, it was estimated that Gazan terrorists sending incendiary kites and balloons had burned 30,000 dunam (7,413 acres) of Israeli land and caused ten million shekel ($2,754,821) in damage. On Friday, MK Moti Yogev (Jewish Home), who serves as a member of the Knesset's Foreign Affairs and Defense Committee, called on the defense system to stop accepting Hamas terror. "We don't want war, but it's time to respond," he said. "It's been over half a year of the IDF accepting - for various reasons - terror activities. This acceptance...harms the security of the south and the rest of Israel."